There is some good news for local Sake lovers. There are two new restaurants, owned by two skilled local chefs, which should hopefully open later this year and both will showcase Sake. Kamakura, owned by Chef Youji Iwakura, and Momi Nonmi, owned by Chef Chris Chung, will offer Japanese cuisine, the first more of a Kaiseki-style spot while the second more of an izakaya. Both restaurants won't merely have a few Sakes on their menu, but will celebrate a passion for Sake. Sake will be a focal point in their drinks program and that is compelling. I eagerly look forward to the opening of both restaurants. There is some bad news for local Sake lovers. The problem is that Sake, in the Boston-area, is being largely confined to Asian restaurants, especially those offering Japanese cuisine. We need more non-Asian restaurants willing to embrace Sake, to showcase it in their drinks program, to pair it with their non-Asian cuisine. Currently, the Tasting Counter is the only local, non-Asian restaurant which has shown a true passion for Sake. With your dinner, you have the option of 10 Sakes pairings with your multi-course meal. Why don't more non-Asian restaurants see the value in adding Sake to their menus? 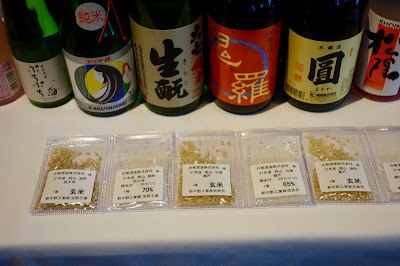 First, let me correct any misconceptions you might have about Sake and food pairings. Sake is not just for Asian cuisine. In fact, it is extremely food friendly and there is a Sake that will pair with everything. Check out my article, The Science of Sake & Food Pairings, to understand many of the reasons why Sake works so well with various cuisines. You can also read some of my related, and more specific articles, on Sake pairings, including: Sake For Thanksgiving, Slurping Oysters & Sipping Sake, Pairing Sake & Cheese, and Sake, Seafood & Lobster Anywhere. I've done Sake pairing dinners at Italian and French restaurants, and at home, I've paired Sake with so many different foods. There isn't a Boston-area restaurant which wouldn't benefit from adding Sake. Many restaurants want to be on the cutting edge of the drinks world, offering wine from hot new regions, local beer from new micro-distilleries, and intriguing new spirits. Well, Sake is on that cutting edge, with thousands of years of history behind it, but there are also plenty of new brewers embracing the future. With so few non-Asian restaurants showcasing Sake, it would be a great way to make your restaurant more unique. One of the main obstacles to adding Sake to the menus at non-Asian restaurants is probably a lack of knowledge about Sake. That is simple to remedy, as all you need to do is educate yourself. There are Sake classes you can take or Sake consultants you can speak to. Sommeliers spend time learning about new wine regions, so why not just extend that education to Sake? Look at it as a new challenge to face, to learn more about this fascinating beverage, and see how well it pairs with a myriad of cuisines. Boston-area restaurants, especially non-Asian ones, please embrace Sake!